We’re adding buildings, houses, stores, roads. But in the midst of all the change, there remain constants, places that remind you that as we look to the future, the past isn’t forgotten. Take a walk on Cameron Avenue in Chapel Hill past the seal that’s attached to a stone pillar. Sigillum Universitat Carol Septent it reads, literally “The Symbol of the University of North Carolina.” This is the oldest part of the oldest public university in the land, part of the landscape for nearly 225 years. Then follow a brick path toward the stone wall that for decades has lined the campus along East Franklin Street. Sit for a few minutes. Watch the students queuing for the bus, the professors heading to lunch. Watch the occasional protests across the street in front of the Old Post Office building — now the Peace and Justice Plaza, but for decades a gathering place for locals to express their strongly-held opinions. Or just watch kids trying to walk the wall, like their parents probably did when they were that age. 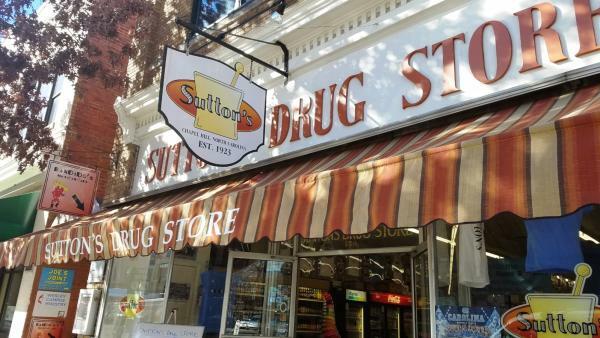 Cross the street and head to Sutton’s Drug, established 1923. The pharmacy is gone now and the menu is more elaborate — it includes, for instance, a pesto chicken wrap — but the grilled cheese remains. Sit down at the counter, a booth or — my preference — a high table, and for just $3.29, you can get that grilled cheese. 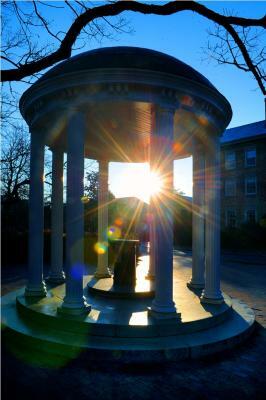 You’ll be surrounded by a multitude of photos of Chapel Hill past and signed jerseys of Carolina basketball stars of yesteryear. It’s like dropping back into a simpler decade. A 15-minute walk south along South Columbia Street, past the imposing UNC medical complex that has sprouted in recent years, is the much less imposing Merritt’s Store. It still looks like the neighborhood gas station it was when it opened in 1929. 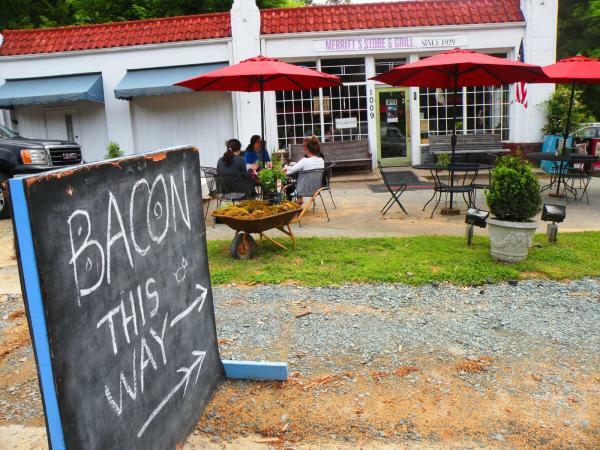 But go inside, and at the sign on the left saying “filling station,” instead of high octane you’ll find lots of bacon. The sandwich is exactly what the cooks’ T-shirts describe: Sourdough BACON BACON Lettuce Tomato BACON BACON sourdough. If the weather is nice, sit in the bamboo thicket behind the gravel parking lot and enjoy crispy, juicy culinary ecstasy. 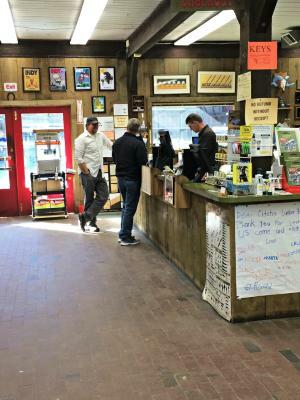 If, after lunch, you still have the energy to do some work, head over to Fitch Lumber & Hardware in Carrboro. Been around since 1907. This is what a neighborhood hardware store used to be. Fortunately, it still is. There’s an enormous array of nails and screws and paints and snow shovels and pretty much everything you would need for your home, including sun hats (Aisle 19) and a 1 ¼” P trap if you like doing your own plumbing. Most important, there are folks there who will tell you where to find what you need and exactly how to use, say, a 1 ¼” inch P trap. North of Fitch on Old NC 86 heading to Hillsborough, from Calvander to Waterstone, is another reminder of how the more things change, the more they remain the same. Here is the bucolic heart of the area, which is why this stretch is officially designated a N.C. Scenic Byway. There are few houses here and no construction cranes. The blacktop winds and curves, as you pass fields and rolling hills, ponds and red barns, and black cows grazing that are all but oblivious to the growth around them.